nstead of getting too familiar with your Auntie Jean’s mustache or your Uncle John’s bunions, get a quality and sizeable family tent for your next camping trip instead. Family camping tents, along with a carefully-selected invite list, are the most important things when preparing for your family’s mini adventure. Although you can’t choose your family, you sure can choose your next family camping tent! Getting a family camping tent doesn’t just need to be saved for the annual trip to the mountains with your nearest and dearest. You can also use the tent with your buddies on hiking expeditions, fishing trips or just your regular guy’s weekend away. Whether you want to recreate your own family camping trips as a young boy or just use it as a sneaky cover to be allowed on more adventures with the guys, they’re a great buy at any time of the year. The only problem with finding a quality tent is that there are so many options – maybe too many. The extensive choices can be almost enough to make you stay home or give in to the idea of a boring spa weekend in the country. To keep you engaged with your caveman side and keep you free from facials, we have rounded up the best family tents currently on the market. Our choices come from the best brands in the business and are camping tents you can always rely on. They’re perfect for different sized families with different needs. But, just before we impress you with these amazing tents, you’re welcome to browse through our top tips and advice! What Types Of Large Family Camping Tents Are Available For Camping? Tents come in all shapes and sizes to fit the needs of different families. A family tent can be small for you and your little ones or have multiple rooms to cater to your immediate and extended relatives. Any family tent can be put into one of two categories. They can either be an instant tent or a non-instant tent. As expected, instant tents can be put up much quicker than their counterparts – but more on that later! From these two categories, a tent will have a specific design. Some designs are made for small families only, while other tents can be for a family of any size. The smaller designs are dome tents that get their shape from their flexible overlapping poles. These are somewhat similar to geodesic tents which are aesthetically similar to dome tents but are a little lower and the poles cross to create triangles. Another example of a family tent for smaller families are elevated tents. These are the easiest to spot because they sit on short legs and elevate campers slightly above ground level. Yet, many family tents make use of the cabin design. Cabin tents cater for suburbia’s married couple and their 2.5 children up to really big families of 16-and-more people. They look more like a cabin because their sides are vertical and often have multiple rooms. Another tent design that caters for various family sizes is the yurt bell tent. This family tent is a bit special and we saved one for you right at the end of our post. Can you wait? How To Choose The Best Family Camping Tents? This is a good question and you’ve already started answering it by joining our camping buyer guide. There are many options available which can make researching them more stressful than having to put some of them up. Narrowing them down with our buyer’s guide will certainly save you time too. We recommend making a list of your necessities and your desired features before browsing. This will help you find a family tent to match your needs without being distracted. It’s easy to be blinded by flash features you would never use. Another hot tip is to look at reviews and read them carefully. Past customers are valuable in providing honest and practical advice when doing your tent shopping. On some platforms such as Amazon, you can even ask past customers your important questions to help you decide. What To Consider When Buying A Family Tent For Camping? No tent is the ultimate tent. Offer a backpacker a family tent and a winter rock climber your average dome tent and their reaction will prove that. Here are nine key considerations before choosing the best family tent for you and your loved ones. the king of all considerations must be the size of the tent and how many people it sleeps. Be careful because some manufacturers use the capacity to their advertising advantage. Sometimes a four-person family tent actually means two adults and two children. If you’re buying a tent for an upcoming adventure with the family, you may want to consider the size of the tent for other uses. Could you use it for weekends away with your wolf pack? Do you expect more pattering feet around the house soon? Buy a tent for the long term, not just next month’s trip. check for the rating of the tent in terms of what seasons it can be used in. The best tents are perfect for three to four seasons. If you’re heading off somewhere especially cold you will need a four-season tent, which is going to cost a little more. 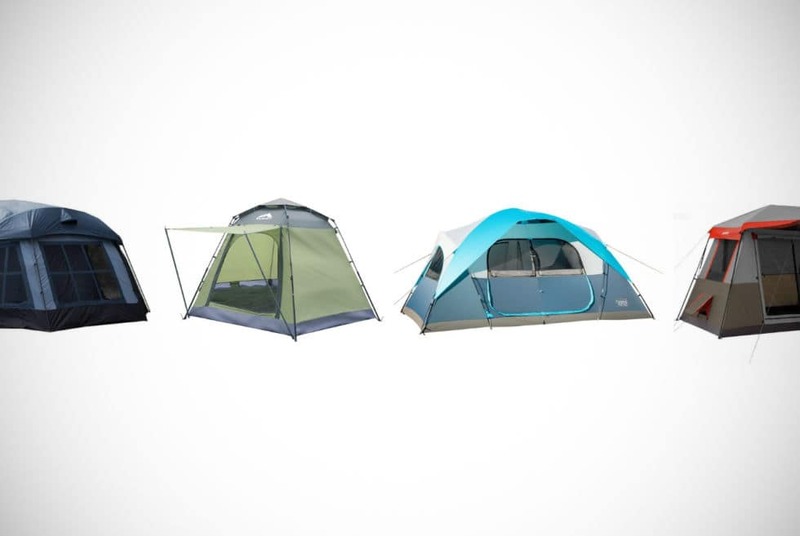 All our upcoming favorites are three- or four-season tents. If you’ll be driving to your pre-booked campsite and staying put to enjoy the pool and other amenities, there is no need to consider trail weight. However, if you’re going to do some wild camping and move from place to place, it’s best to look for family camping tents with a light trail weight. Either that or let your girlfriend carry it. in just a moment we’re going to get into this in a bit more detail. For some campers, how the tent assembles is nearly as important as the capacity it holds. Standing around staring at the ground and different-sized poles is not a good way to start the holiday. Unless you have good patience, there are some other innovative options. More will be revealed, shortly. many bigger families will not want a single door to get in and out of their tent. That wouldn’t be convenient if one of you took an early night or one needed to “pop-out” in the very early hours. Instead, the number of doors on the tent should be part of your considerations. You may also want to look for D-shape doors, these are much more convenient to pass than T-shape doors. do you need privacy? Some family tents have different rooms which come in useful if you’re going camping with other couples. The alternative is a bigger social area. Whereas a huge social area may be better if the weather sends you inside, the additional privacy may be more than welcome to campers who are guaranteed hot evenings. Some family tents even have detachable dividers that can accommodate the company they keep. We have two of those for you below! storage is important in a tent and we’re not just referring to those mesh pockets. They’re important, and while we’re at it, they’re better when raised to avoid your drunk uncle standing on your smartphone. However, more important is the amount of storage you have in the other parts of your family tent. Do you have a porch? Or a canopy? These are the best places to store wet and dirty clothes and to keep your sleeping area clean. If you have a lot of stuff and no more room in the car, it may be worth considering a bigger tent and designating a spot to some items. if you know your socks have a questionable odor or haven’t been able to pluck up the courage to tell your wife about her camping breath, it’s best to just buy optimal ventilation. Ventilation in a tent is really important to keep odors away, but it’s also useful to increase comfort on a warm night and just generally improve the quality of air in the tent. 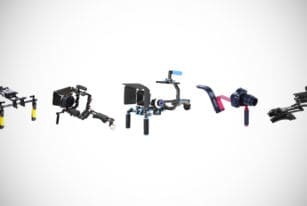 It goes without saying that the more impressive features the better, but don’t blow your budget on something you’ll hardly use or could have done without. Keep an eye out for internal lighting, a space for a stove, room for a real king-size bed, mesh shelving, material to block out the sunlight, glow in the dark ropes and more. Oh, that got your attention. Keep reading to find out about all these features on what we think are the best family tents currently on the market. What Brands Make The Best Family Camping Tents? The camping market is very crowded but thankfully there are lots of different brands making top-quality family tents. This may make it more difficult to narrow down your choice, but it also means you have a choice! Some of the best brands are included below. But we didn’t go straight to the known manufacturers to compile our camping list. We gave everyone a fair shot and found some hidden gems along the way. Nevertheless, some of the best tents below come from some of the most reputable providers of family tents. Namely, the likes of Coleman, Core and Alps Mountaineering can be found multiple times in our top 24. These are all respected brands and continually provide quality tents alongside excellent customer service. For example, Coleman’s testing on their own products is so strict that they often send their own designs back to the drawing board before allowing them to be bought by you. We’ve explained some of these tests as you venture through our list to give you an idea of their high standards. The other top brands are very similar and always bring their camping A-game. How Do You Put Up A Tent? Ask your grandad how he used to put up a tent. Don’t be surprised if he lays down detailed blueprint plans like a war general. Nowadays, the best family tents aren’t set up in the same way. They have advanced technology which allows them to be pitched much faster. usually accompanied by bickering, head scratching and maybe even some cursing; the traditional method of putting up a tent is being phased out by the best tent manufacturers. This involves assembling long tent poles via clips and threading them through the inner part of the tent. Followed by adding the external part of the tent and securing it down in multiple areas. Newer tent makers have taken the stress and partial guesswork out of this process by adding color codes to the tent poles. Some have even made their pole sleeves sealed to prevent snagging as you shout “push” and “pull” from opposite sides of the tent. more recently, there are quality and innovative tents that take just seconds to be pitched and collapsed. With the touch of a button or the release of a strap, these tents fully erect themselves ready for you to add some ropes or secure it down in vulnerable areas. These tents frequently, but not exclusively, come in a more rounded carry bag. the efficiency of the pop-up method is rivaled by modern tents with pre-assembled poles. What this means is that the poles have already been placed inside the tent when neatly stored in their accompanying travel bags. Campers simply have to unpack their tent and clip the poles together and lock them in a couple of key areas. The tent will then simultaneously become erected. You’ll find all three of these methods below within our feature list. So, whichever one you prefer, we have something in store for you! Where Is The Best Location To Set Up A Tent? As you get closer to your camping destination, the excitement of a weekend away from the hustle and bustle of the city can soon hit. But, don’t let this excitement make you rush your camping set up. Where you choose to pitch your tent is very important. The first thing to look for in a great camping spot is the surface. You need to find a level surface so you and your fellow campers aren’t sliding into one another. If you can’t find anything level then make sure you place your head up the slope. You also need to check the surface for debris and rocks that may give you an uncomfortable night’s sleep. Tomorrow’s hike is going to be a lot less fun if you have a knot in your back and can hardly keep your eyes open. Another fantastic tip is to avoid hills. Many rookie campers may be mistaken in thinking the bottom of a valley is the optimal position to be sheltered from the wind and sun. But, ask the same camper what they think of their decision when they wake up in a gigantic puddle of rainwater. By no means does this mean you should let your tent be overly exposed to the wind. You should still attempt to find shelter from chilling gusts. If you’re struggling to find a significant hideaway, you should make sure your door faces away from the wind. Facing a door head-on into the wind can cause ropes or flaps to be blown around and these noises can prevent you from getting some well-deserved sleep. One of the elements that need to be avoided the most is the sun. The sun’s rays will not only cause your tent to feel more like a sauna, but it may also even damage your tent over the long term. There are not many worse feelings than being woken too early by a blistering sun after a night of a few too many beers with your hotdogs. To avoid this, find a shaded spot between trees – but also consider where the sun will be rising from in relation to your position. Keep these tips in mind when setting up camp. Remember to consider all these factors when putting up your family tent and try to get to your spot early. Setting up a tent in the dark is the key ingredient for a premature family-holiday argument with a side of mosquito bites. When you leave your super location, also remember to take your litter and other belongings ready for the next smart camper. You’ve seen the advertising pictures. A happy family smiling while they enjoy a picturesque scene and some delicious food. So, why is it that many of your family camping trips are never like that? If your trips are more soggy socks and shivering than sizzling sausages and sing-alongs, it’s time to consider some tent extras. There are some items you can add to your family tent to make the getaway much more enjoyable. When the weather forecast lied, and you’re sat in the cold, you probably wish you had a heater that is specifically designed for a tent. You can get just that. There are specific tent heaters on the market to turn sad campers into happy campers. On the other hand, if you’re sat in your family tent gasping for fresh air and feeling hot and sticky, some clever people have made tent fans to freshen up you and your tent. Both of these products come in different sizes to suit different sized tents. These are definitely worth it if you’re camping in locations known for adverse weather or at the hottest and coldest times of the year. Without blowing your mind, another great addition to the camping arsenal is a tent carpet. The obvious benefit of having a carpet inside your tent is that it will certainly make it more comfortable. Yet, there are other benefits that aren’t always realized straight away. A tent carpet improves insulation, so you stay warmer and it helps protect the tent from damage. It even reduces the amount of noise as you move around and get up in the middle of the night – not to mention the style factor! Are they worth it? If you’re staying put on your camping adventure they’re a must-have, but if you’re hopping from location to location they’ll fast become an annoying hiking buddy. A third tent extra you should be considering is a tent extension, or often referred to as a tent canopy. These give you that bit more sheltered space to store your belongings. They’re a great place to store your muddy gear that, if you dared leave near your wife’s pillow, would have you sleeping under the stars – whatever the weather. They’re also a great place to socialize and dine. It’s apparent that they’re very multifunctional and a great addition for many family camping holidays. What Are The Best Tips To Make Your Family Camping Trips More Awesome? Now you have an idea of all the main gear you need for the best camping adventure, it’s time to consider what else you may need and what you will do. We know you’re going to enjoy the view with a cold one in one hand and a plate of chicken wings in the other. But, what about the other times when you’re not hiking, fishing or self-indulging? To keep the whole family happy, here are six top tips to make your urban escape even more awesome and some tips to help it run smoothly. this includes your tent! Trial and test all your gear to make sure you don’t end up in the middle of anywhere with a hole-stricken tent and a torch without batteries. make your hikes and evenings more enjoyable for you and the kids by taking along some family games. 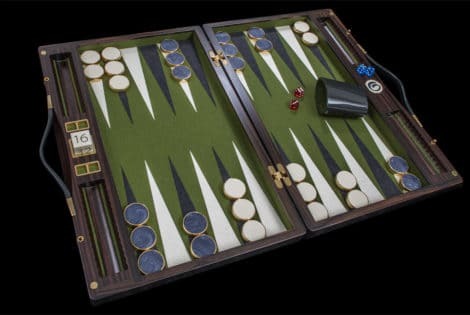 You could bring along the household’s favorite board games or rely on the classics such as I-Spy. Or, how about getting more creative and making an orienteering adventure or an active treasure hunt? duct tape is the campers’ savior. It comes in handy when you rip part of the tent or are trying to make a washing line. The little details matter – remember to pack the smaller items that make a big difference. Put the likes of matches, a bottle opener, coffee, marshmallows, a mallet, camping cutlery, kitchen roll and other necessities at the top of your list. solar power may be the best way to make your camping experience even better. With some planet-friendly power, you can decorate your area with lights and have fun with the kids while doing it. before you argue who lost the car keys, take a stackable organizer to make everything go to plan. These little storage units are perfect for separating your items and go beyond the internal storage offered inside most family tents. They will definitely save you some time from playing hide and seek on your own. So, should we get to the best 20 tents now? We had to ease ourselves into the camping lifestyle by first trying out a family tent of the highest quality. To do that, the first tent we reviewed was this eight-person tent made of duck canvas. Does that mean it can float when the rain pours down? Unfortunately not, but it does mean that this is arguably one of the most durable and watertight tents on the market at the moment. In fact, this tent is a marine-grade family tent! This large camping tent has a lot of cool features that can be admired and utilized in any season. It has two D-shaped doors you can glide through and it’s spacious enough to let anyone that’s six-and-a-half feet or under fully stand up. The designers have added four windows that are all larger than normal so you can admire your setting while simultaneously enhancing airflow and managing the tent’s temperature. This is as well as two strategically-placed vents! 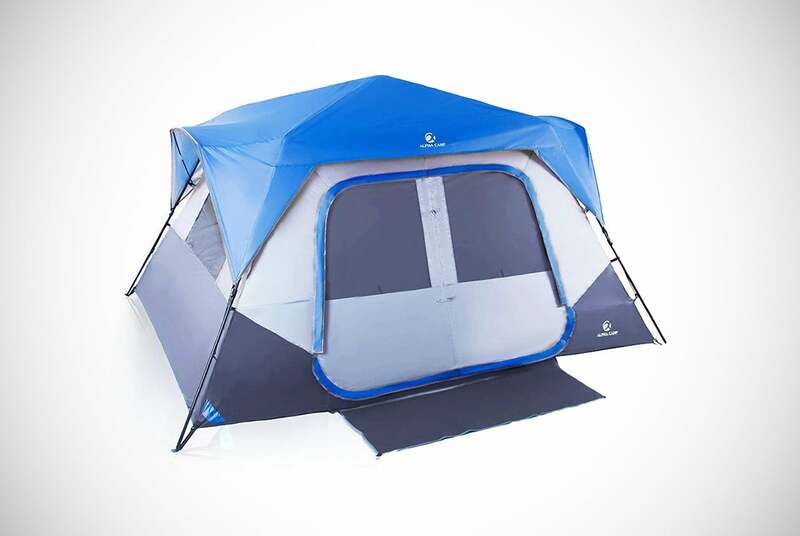 This family tent can even be put up with only a single pair of hands. It oozes longevity from its duck canvas shell to its heavy-duty steel rods to its extra-durable zippers. You would be quackers not to get one! 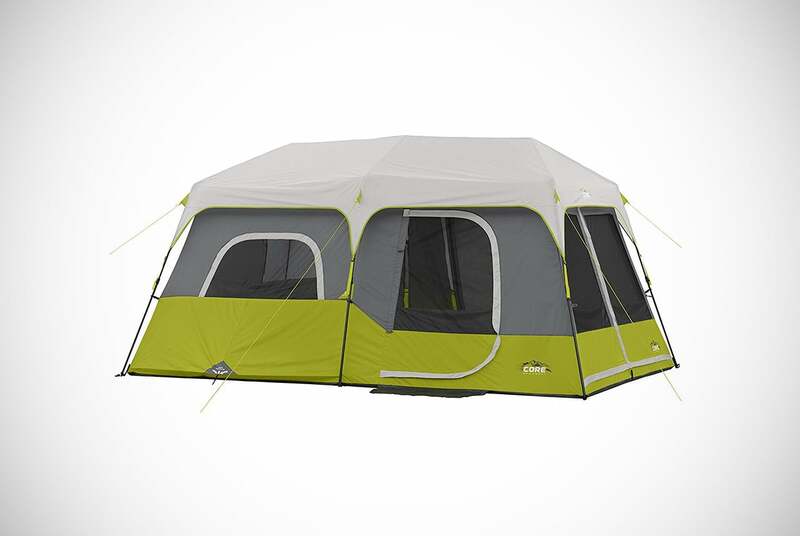 Another spectacular eight-person family tent is this one from the happy campers over at Coleman. This is a brand who know a lot about tents and we’ll be showing off some of their other designs as we go. This family camping tent has a lot to offer. Even though it doesn’t have any outlandish innovative features, it does the fundamental things well. It’s predominantly made from polyester and even has a patented floor and seam design which is exceptional at keeping campers dry. To keep the rain away, even more, it has cuffs surrounding the zippers to keep the whole design watertight. They have added a screened room to the tent to give evening discussions a shield from pesky critters. This screened-off area is great for watching the stars without worrying about bites from mosquitos or flies sipping your beer. It’s also used as a way to enhance air ventilation through the family tent and it can double as a sleeping area on dry summer nights. One other cool feature is mesh pockets to keep your frequently needed items at an arm’s reach. 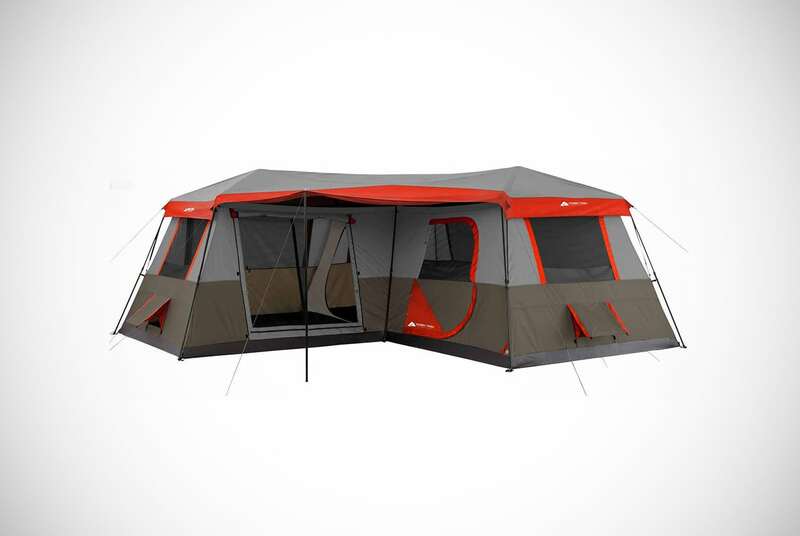 The third family tent on our camping radar is the Core Nine-Person Instant Cabin Tent. It offers some awesome things that the previous two didn’t have, including the option to bring along one other family member, a family friend or just the family dog. This tent has a phenomenal pitching time. Within one round of I-Spy, the family tent can go from its carrying bag to being erected. It takes just a minute to get the tent up because this is one of those tents that has its poles pre-inserted. There will be no snagging the pole on the tent and almost ripping it here. Simply lock in the poles at three different points and begin to enjoy your fantastic family tent. 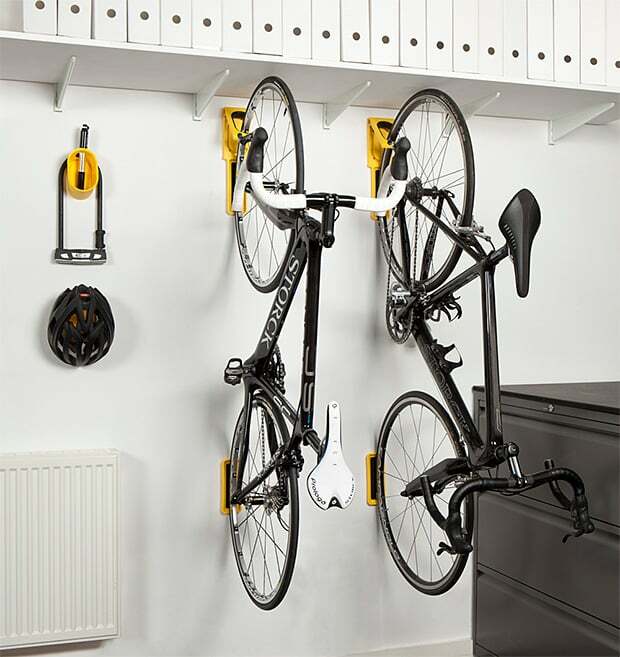 A minute later, once inside, the whole family can make use of hanging storage to keep your valuables off the floor, an adjustable ground vent for tailored airflow and even an electric cord! 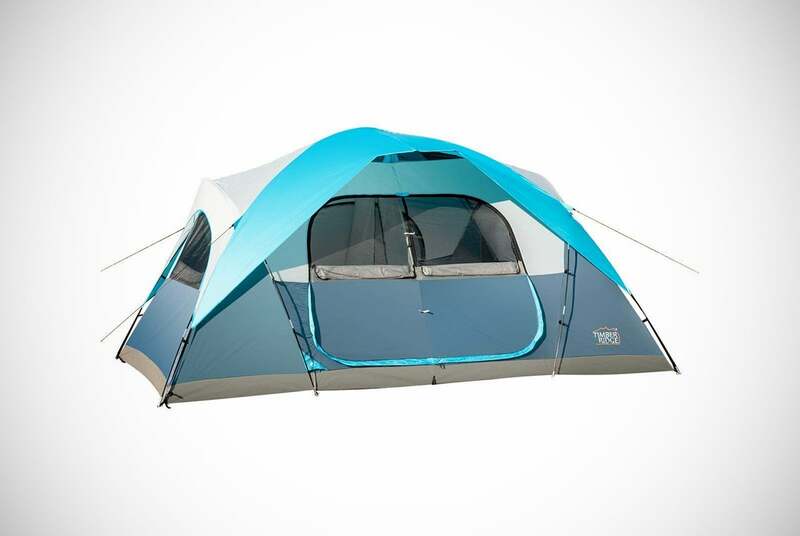 This family tent has an electrical cord port where you can slide through a smartphone charger or whatever other electrical appliance you brought along for the adventure. Don’t worry, this access point can be fully closed when not being used to maintain the tent’s enjoyable temperature. The inside of the tent may also be adapted due to preference and needs. There is an attachable room divider to give a little more privacy or leave it off for socializing and an open living environment. Everything you need is included and it comes in a neat and tidy carry bag. Just like the previous three manufacturers, Browning Camping is a big player in the camping scene. Browning put their creations through some rigorous testing to make sure they are going to withstand the harshest elements. If it’s on the shelf with their name on it there’s no doubt it passed with flying colors. The design is a free-standing family tent which will not require the extra time to peg it down and tighten ropes. This is convenient when pitching your tent, but you can use accompanying ropes if you want even more resistance from the elements. This is another family tent that has been divided into two rooms, which is great for a little more privacy. Or, you may just find yourself sharing with the kids if you’re in your partner’s bad books. Let her have the last hamburger, it will be worth it for the more spacious sleep. 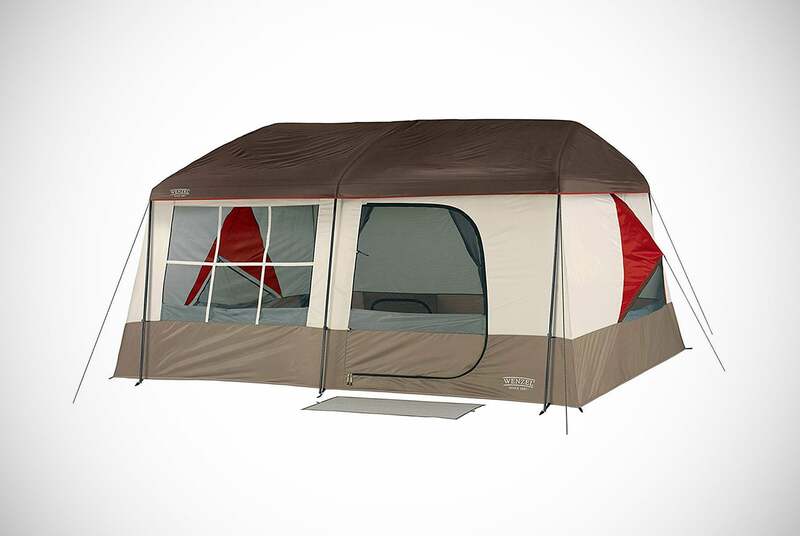 Other noteworthy features on this family tent are its two wide doorways and many windows. The doors have been neatly placed to accommodate each of the two rooms. 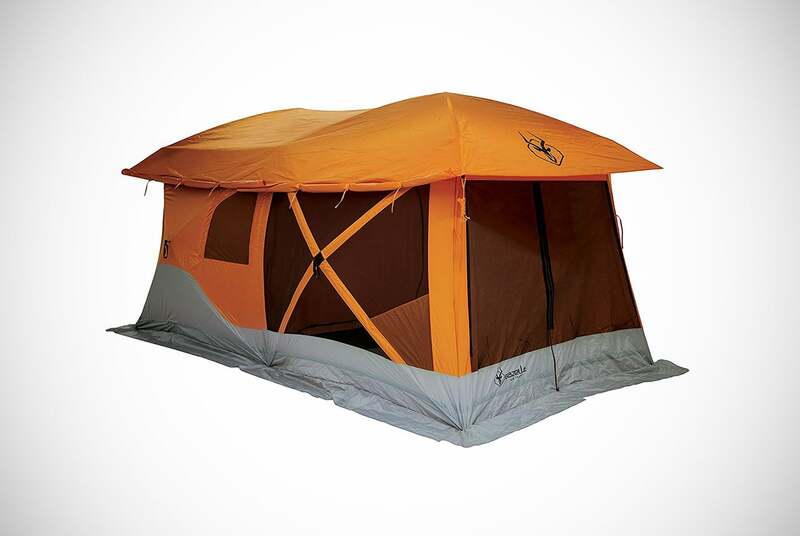 This may be one of the best-ventilated tents on our long list with a whopping six windows and even a mesh roof. If you want to take a photo of the night’s sky simply reach over to one of the mesh pockets, take out your camera and create some family-photo favorites. One of the biggest family tents you’ll find is right here in the form of three-room cabin design. It’s so big, owners could fit in three queen-sized air mattresses. Or, lay out the sleeping bags and have room for twelve people. Bring the whole family and have a fantastic time with this exceptional and yet private cabin family tent. 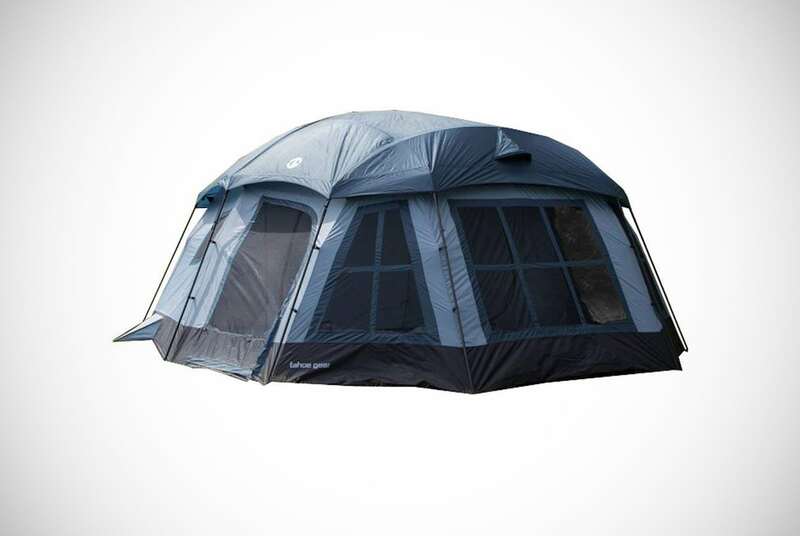 From the outset, this tent is going to give you an enjoyable family camping experience. It’s another type of tent which is packed with its poles and rods pre-assembled. You just need to unfold the tent from its carry bag and extend the poles in the right places to unveil a solid structure. One of the coolest things about this family tent is that it has ground ventilation. Let’s be honest, with twelve of you in there you’re going to need some ventilation. And, we aren’t just saying that because of your Uncle Albert’s smelly socks. What’s even more impressive is this ground vent is spacious enough to fit a portable air conditioning unit. Is this the best large tent for the hotter family expeditions? It features seven windows that can be completely closed to avoid the wetter weather and windy conditions. To keep you and your family dry, it also has immaculately-manufactured sealed seams. Together these design aspects make for a reliable family tent. Once the midday sun arrives, set up camp for the second time that day under the front awning. This will give you plenty of shade to keep the UV rays away and your beer cool. There are lots of reasons why campers are choosing to buy this family tent and we’re on hand to tell you all about them. 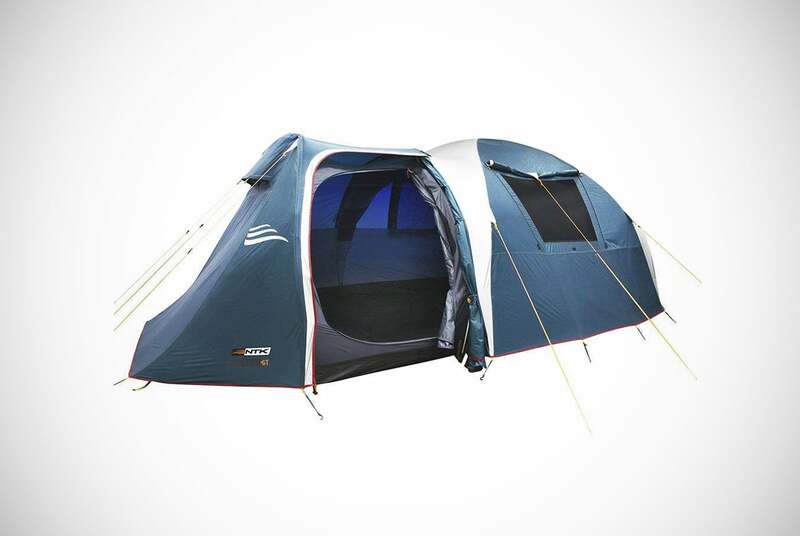 It’s a tall and large camping tent that can fit up to ten of the family. There are a couple of standout features we want to talk about but let’s start with the company’s special ventilation technology. They have innovatively managed to create a ventilation system that can not only be adjusted but will cleverly draw in air from the floor of the tent and push heated air out of the mesh roof. This will stop your tent from becoming stuffy on an evening and help to expel odors. To cater for the tent rush hour as the barbeque gets fired up or as the rain begins to pour, this family tent has two large D-type doors that lead into separate rooms. Other nice features include an electrical cable port so you can still enjoy some of your home comforts when the sun goes down. This port will completely close when not in use to keep out the cold and the creepy crawlies. One of the additions this family tent has that the others have yet to provide is a lantern hook. To keep the campfire stories going when the campfire has burned out, just head on inside and surround the lantern. The tent comes wrapped in two things. One of them is an expandable carrying bag for transporting convenience. The second is a 12-month warranty for purchasing protection! Next to be reviewed is another Coleman family tent, but this time, they have made a cabin design instead of a smaller dome tent. 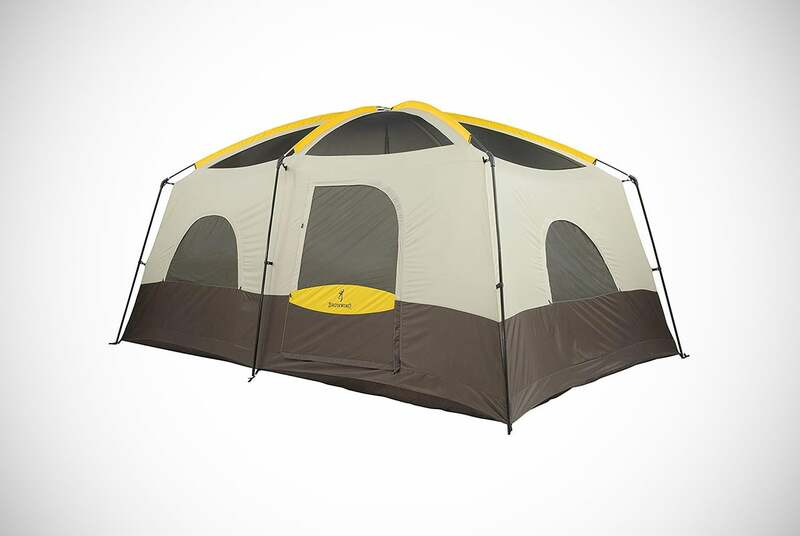 You can invite your eight favorite family members with this tent or just eight of the guys? Whether it’s a family getaway or stage one of the bachelor party, you can enjoy some cool features in this tent. You’ll be dry and warm all night thanks to a rainfly and the company’s special WeatherTec system. Once you’ve taken the time to find the perfect camping spot, you will be able to get it up in super quick time. Although it’s not an instant tent, they have cleverly made the pole sleeves continuous instead of in sections. This means the pole will never snag and never damage the family tent. It also means your poles are completely covered at all times. Moreover, the poles clip together instantly so there will be no issues there either! You better not start taking these e-ports for granted, but this is another quality family tent with a compartment to run a power cord inside. Yet, we haven’t told you about the best features. This is the only tent on our list that includes LED lighting! With some batteries or a rechargeable cartridge, happy campers can get some light to read a trail map or a book. The light can even be tailored to your preferences with three different brightness settings. If you listen closely, you can hear campers rejoicing in the distance. Other awesome features include oversized windows so you and the kids can watch your private nature show and pretend to narrate like David Attenborough, and exceptional ventilation to keep your family tent feeling and smelling fresh. You’ve made it to the one-third stage of our camping buyer guide extravaganza and we’ve seen some quality options so far. We certainly weren’t roughing it. We’ll continue the high standards currently being set with a look at the Marmot Limestone Six-Person tent. Setting up this tent is made slightly less stressful because the manufacturers have added color codes to their poles. Even though it isn’t going to erect itself in seconds, this will be a welcome addition to traditionalists and will definitely let you concentrate on more important matters. We mean sizzling a few sausages or heading off for some fishing of course. There are a lot of awesome features on this tent that you’ve already heard above but are still lucrative additions to any family tent. These include a waterproof rainfly, reinforced seams, and D-shaped convenient doors. The ventilation system is also impressive and has been strengthened with Velcro to secure it down when the evening chill starts to hit. Despite this being a dome tent, Marmot has attempted to reap some of the spacious benefits of a cabin tent. The tent has a pre-bend zone construction to make the sides of the dome more vertical. This gives the tent that extra few inches along the side and more importantly, increases the amount of headspace you have. Back to Coleman’s headquarters to take a look at a family tent that solves one of the ongoing annoyances when camping. This tent is one of their Dark Room range. What this means is the tent has been specifically designed to block out natural light and most importantly the sun. This lets you sleep in longer and get a night of better overall sleep. It also means the tent doesn’t become too hot and uncomfortable. In fact, tests show that this tent will block 90% of sunlight and keep the internal temperature 10% lower than normal tents. Convenience runs through the seams of this tent as it also has exceptional ventilation and pre-attached poles to make pitching the tent easier. How will you spend the pitching time saved? The focus on providing a dark and cool tent hasn’t detracted from its ability to withstand the elements. Coleman actually put their family tents through weather simulation to see if they pass their benchmark for quality. They spray 35 gallons of water on their tents within ten minutes and if more than two tablespoons of water are found inside then they refuse to sell it until it has been improved. All of this innovation and quality comes neatly packaged in a transporting bag that can be expanded for other accessories. Sold? 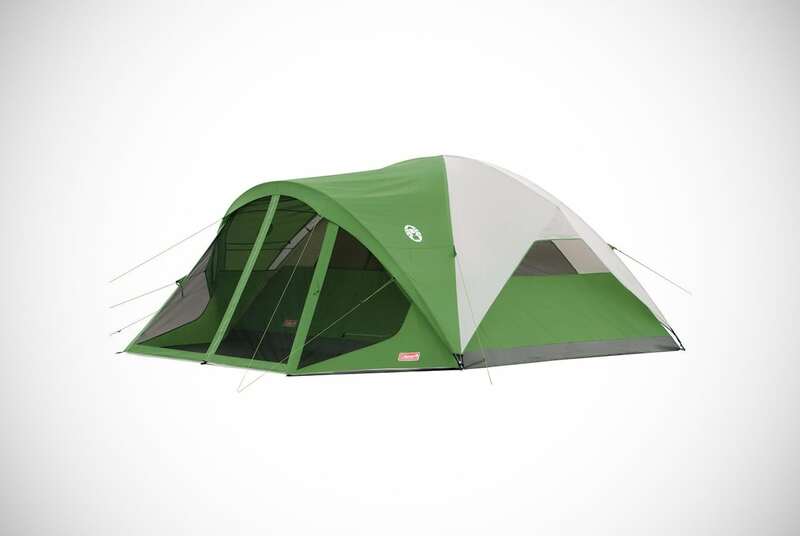 This is the biggest family tent on our buyer guide and perfect for the whole family. It even has a master suite and comes in a choice of orange or blue, which may get the family bickering but its impressive features will certainly have the whole family agreeing once again. The center of the tent has a height of seven feet which will let most of the family stand up and maybe even stretch in the morning. It has a polyethylene floor, a 12-cm polyester rainfly, and enhanced seams. Why do you need to know this? These three specifications make the tent one of the most waterproof on the market. 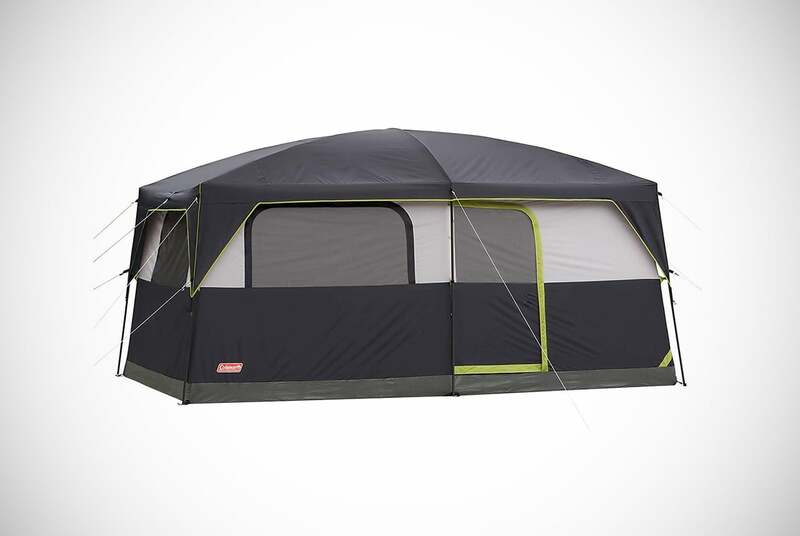 One of the most appealing aspects of this family tent is that it includes a fly canopy. For when the sun beats down a little too hard, relocate your deck chair under the canopy and enjoy a cold beer and some nibbles while you and the family watch nature unfold. The canopy comes with ropes to make it even more secure when the wind picks up. One other great addition to this family tent is the extent of its ventilation. It has floor vents and mesh vents in all the crucial areas to create the perfect ventilation cross-flow. Gather up nine other family members or leave your least favorite aunt at home and bring the dog instead. 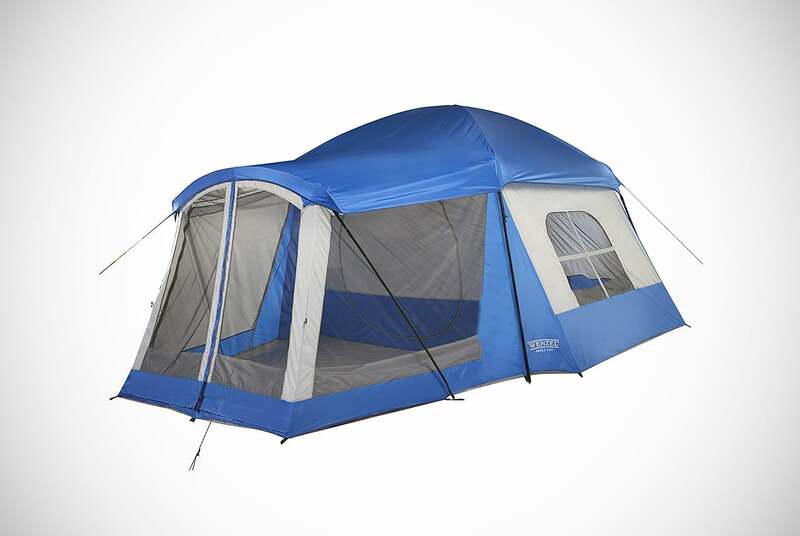 This ten-person-capacity family tent is another outstanding option for annual or avid campers. If you thought the last one was a tall tent, then be amazed as it has just been beaten by this one. With a peak height of 7.2 feet, even the tallest of family members will be able to avoid a sore neck. This is one of the brightest family tents as the large zippered windows allow light to flood the area and create a welcoming and fun environment. Just looking at it gives you a different feeling; it looks more like a small cottage than a family tent. The tent can be divided into rooms and has an extra door for convenience. What adds to its convenience factor is the inclusion of wall organizers and hanging shelves. It’s that practical, you could have it permanently pitched up in your garden and use it as your next man-cave. From the color-coded poles to packing it away in an expandable bag with wheels, everything about this family tent screams practicality and convenience. It’s certainly unique in a crowded market and already has a lot of fans. Hold a family vote because the only real choice you may need to make is between getting a blue or green Timber Ridge family tent. This tent comes in a choice of colors, but the choice of impeccable quality is non-negotiable. It has a lot of the stuff you’ve come to expect from the best family camping tents. 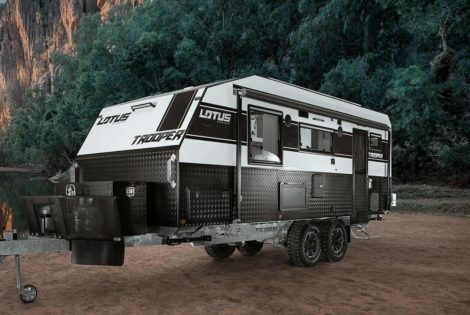 Owners can make use of a room divider to create private quarters, five windows to let light inside the tent, watch the local wildlife or just help change the tent’s air. The rooftop ventilation will help as well. It’s also packing two D-shape doors to enhance camping traffic flow and stop you falling over your sleeping bag. It even has an electronic cable port which they even recommend using for solar powering. We thought Timber Ridge designers used up all their good ideas on this family tent but obviously, they’re a clever bunch. Next into the Men’s Gear campground for detailed analysis was this unusual tent design. It has the features of a cabin-style family tent but also has the luxury of an added porch. The main cabin area has room for five of the family and the camping porch could even host three more in dry and warm months. The porch has a screen to keep out mosquitos and other pests while also having a UV-ray and water-resistant shelter. The awesome porch is a pivotal part of the design with a lot to offer. Not only does it allow you to enjoy the outdoors in comfort, but it may also feature as an area for your wet and dirty gear. This way, your sleeping area remain spotless for a perfect night’s rest. Two windows in the main cabin area enhance ventilation further and work as nice finishing touches. 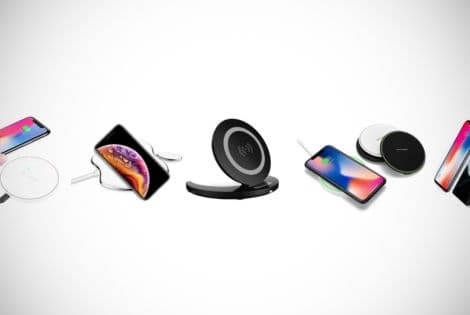 We would get the grey one, which one would you get? Another unique design which seems to be growing in popularity for wild campers and those flocking to commercial campsites is the elevated tent. This elevated cot family tent is raised from the ground to give you a deep sleep that rivals your bed at home. It’s raised from the ground to keep you away from small rocks, uneven ground, bugs, and any accumulating rainwater. Not only is it a great small family tent, but it’s also the perfect family buy. Why you may ask? It can convert into a lounge chair. Keep it as a lounge chair at home on the patio then take it away for the annual mountain adventure with the kids. This way, you get more for your money. These designs are much easier to pitch and usually simply unfold with a couple of bits of slotting and clipping here and there. This one does just that and taking it down is even easier as its aluminum frame collapses in seconds ready to be stored. It has added protection from adverse weather and includes four no-see-um doors. Nope, the cat didn’t just run across our keyboard. This is the name for family tent doors and windows that enhance ventilation but do not let insects through. Although this family tent just falls short for the award for the tallest tent at 7.17 feet, it’s by no means lacking behind in size. With floor dimensions of 14 feet at each side, it’s a big tent that will let you write eight other invitations. 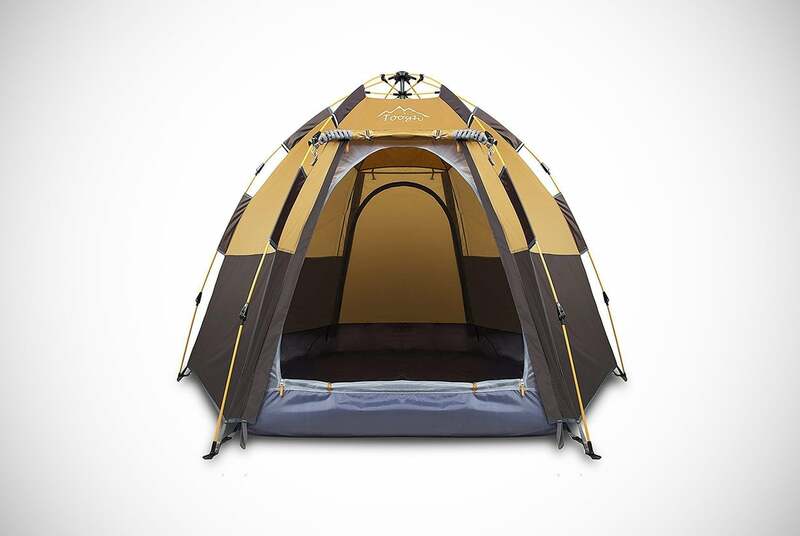 For the number of campers this tent can hold, it’s exceptionally lightweight and will not leave you lagging behind on the family hike to the waterfall. Setting it up is as breezy as the internal ventilation due to a simple pin-and-ring design that is easy to follow. Once inside, you will be able to sit in one of two rooms and store your gear in the tent’s gear lofts. Or, make use of the cool hanging pockets. One of the most appealing parts of this tent is that it comes with a mud mat, so your sleeping area always remains clean. 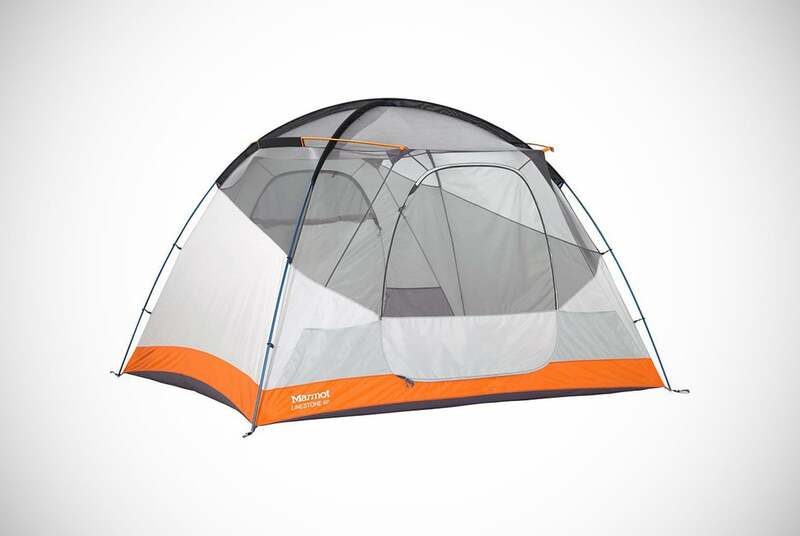 This is a solid tent that has a lot of beneficial features. It even comes in a choice of blue, red and tan so you have more than one thing to decide than just this year’s camping destination. 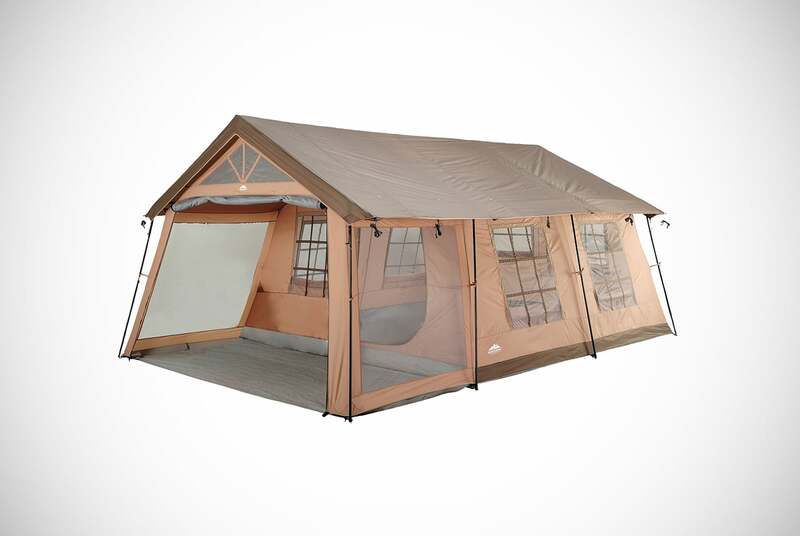 This family tent is perfect for a family of four looking to explore nature in comfort. It’s made with robust materials that are more than capable of doing their job. Quality Oxford fabric which has been silicone coated will keep your dry in severe downpours. However, the best thing about this tent is that it pitches itself! It’s a pop-up family tent which will go from a compact package to fully set up by simply lifting the top of the tent. To make it even better, it will automatically fold itself in just as quick a time. When the weekend has exhausted you the last thing you want to do is pack up the tent. Instead, choose this family tent and let it fold itself by pressing the poles with color-coded labels. Other aspects of this tent that you should be aware of before buying is that it has two large T-shape doors and mesh windows to improve airflow and cool down a stuffy tent. This mesh will also keep away troublesome critters too! 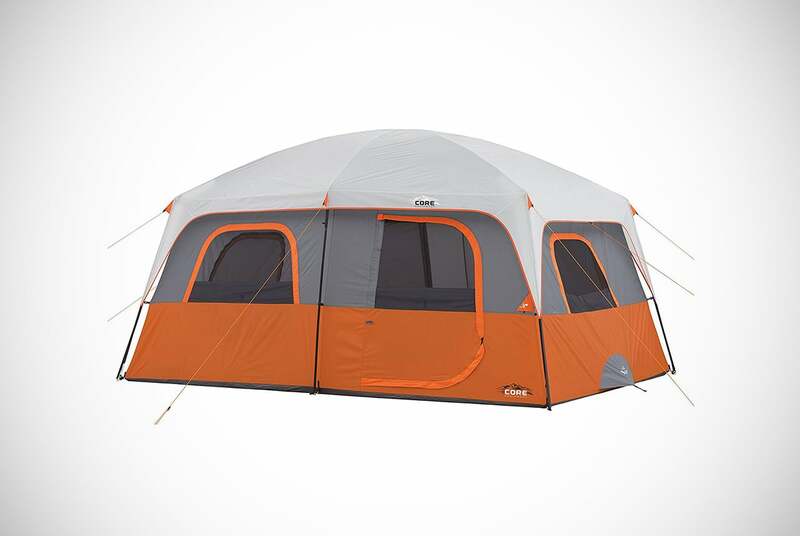 Another large-capacity option is the NTK Super Arizona 12-Person Tent. This family tent doesn’t just look like some sort of space capsule, it walks the walk as well. 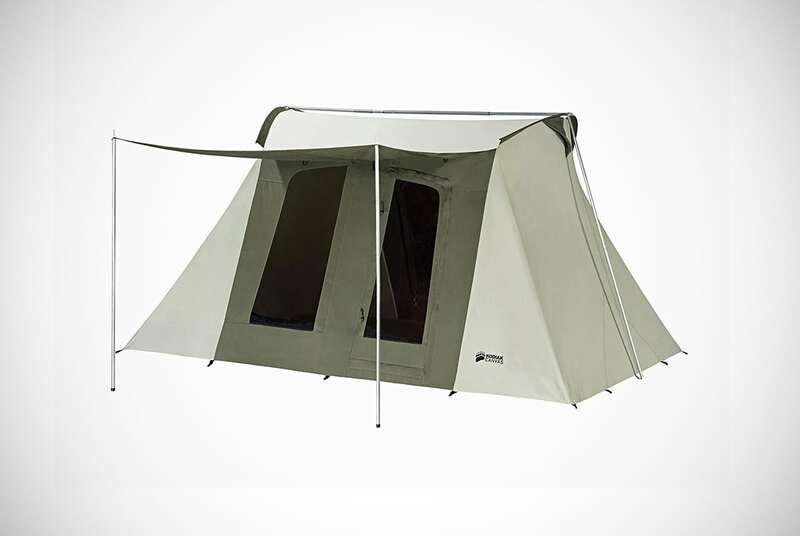 Like one of the previous camping tents we showed you, this one has a detachable room divider. This allows you to set the tent up for the company you keep. The frame of this family tent has been made to withstand intense winds. The fiberglass rods house nanoflex cords to keep the structure nice and sturdy as the winds pick up. It battles the elements even further by extending the rainfly to completely cover the tent. This rainfly provides protection against heavy rain and the sun. Once you enter the tent, you will be greeted by some more of that impressive no-see-um mesh. Mosquitos can only be envious spectators to your games-and-snacks night. This sort of mesh also increases privacy when not using the rainfly. Other cool design features are the tent’s D-style doors, a gear loft to keep your flashlight and water bottle out of the way and a label to personalize your tent in case it gets lost or left behind. We’re on the home straight now but certainly not tiring of quality! The next family tent that was investigated by our researchers was this instant large camping tent by Gazelle. It’s another pop-up design which will keep the family peace and save time. Even the attachable rain shelter connects to the tent in seconds. With easy-to-use snaps, the rainfly covers the whole roof with minimal effort and provides outstanding protection from intense rain. The bottom of the family tent is as durable and protective as the other end. It’s made of polyester and the inside seams are secured in place with a special type of tape. This tape is removable, which lets you give it a shake to remove any dirt or sand. Other reliable ruggedness is found on the tent’s zips. These zips have been made to not snag, break or leak water. From setup to sundown, this is a remarkable family tent guaranteed to be the backbone of an exciting family adventure. 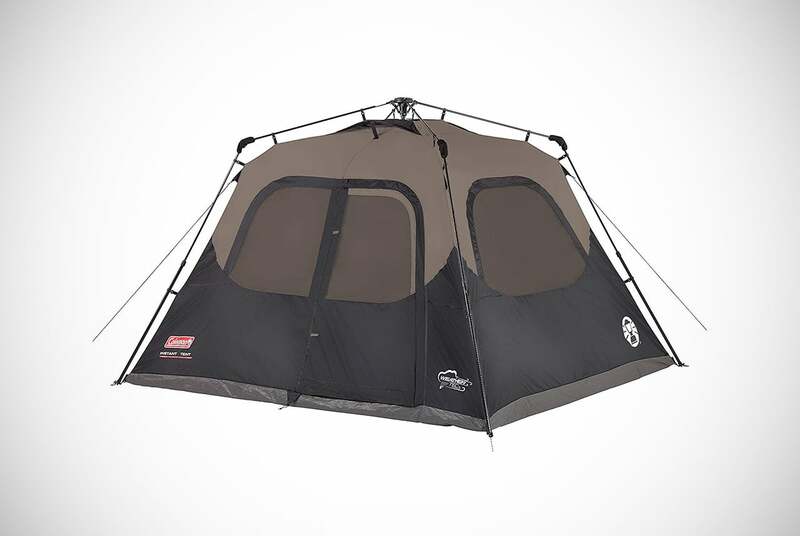 Back to a Coleman design and this family tent is the only choice for those going to camp in notoriously windy locations. We already told you about Coleman’s strict and rigorous testing when it comes to rain. They apply the same difficult tests to their tents when it comes to the wind as well. They simulate wind speeds up and above 35 miles per hour. If it breaks you aren’t buying it. The fact this one is available means it’s exceptionally brilliant at withstanding the wind. They again add their snag-free continuous pole sleeves to this tent so setup is as seamless as possible and you aren’t at risk of damaging the waterproof material. The flooring is welded using a patented design and the seams have been inverted to add to the tent’s impeccable water resistance. The tent also plays home to an electronic port so you can keep the electronic entertainment running or charge your smartphone with ease. When you’re not charging your phone, simply slide it into one of the internal mesh pockets so it doesn’t get trodden on by excited feet. The whole design is nicely rounded off by a number of functional windows and ground vents. After reading about 19 of the best family camping tents on the market, you may be beginning to think there could be anything new and innovative to the following designs. Sometimes, even our smart Men’s Gear readers can be wrong. This light camping tent has a clever feature that we have yet to encounter up until now. The tent’s rope has reflective materials added to it. No way will a late arrival to the campsite send your tent lopsided because they couldn’t see your rope in the low light. This is a cool little addition that can make a big difference. They have been a little different than the others in another way too! They have made their internal pockets really big. Instead of fighting for smartphone space between the relatives, enjoy roomy and secure storage. This family tent isn’t always singing and dancing to other tunes. 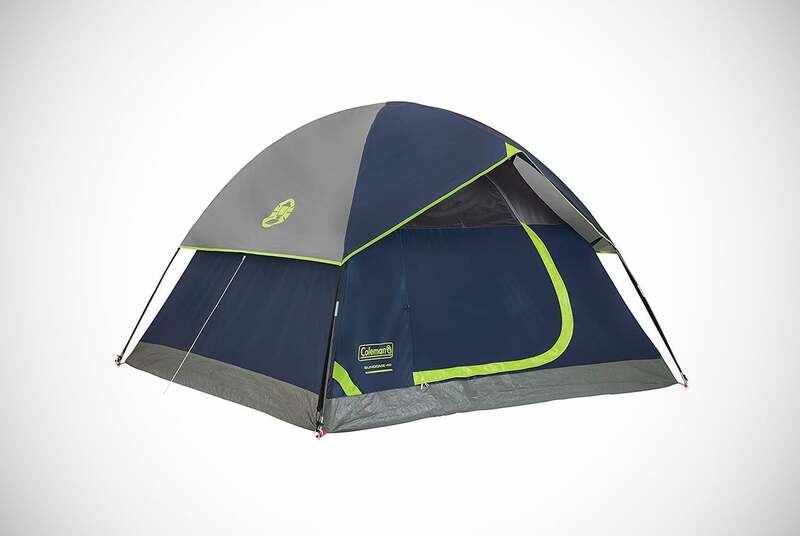 It does have some state-of-the-art features that are common among the best family tents. The manufacturers have included an electronic port for 21st-century entertainment in timeless beauty. And, they have added excellent ventilation! The welcome flow of air is maintained using a large D-style door and a whopping five mesh windows. The mesh windows allow the tent to avoid becoming stuffy, keeps the bugs out and the views amazing. What’s not to like? Well, that was a long one… Did you enjoy reading about the awesome features of these family tents? There are certainly a lot of options out there and even when we filtered out the junk, we were still left with 20 impressive options. With manufacturers like Core, Coleman and ALPS Mountaineering, it’s certainly hard to choose a favorite. Remember to consider your own needs when picking the best family tent for you and definitely keep in mind all of our other key considerations we discussed in the beginning. These will come in useful and help you avoid many novice camping pitfalls. We hope you found your next family tent on our buyer guide and remember to drop in again for more cool discussions about the best gear for men, right here on Men’s Gear! 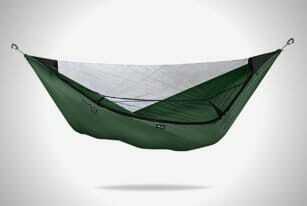 The Ninox FlatLay Hammock lets you sleep in any position you want--on your back, side, or stomach. It uses soft Teslon 3 fabric and adaptable to any terrain.